Temptation dark chocolate 72gm each. Ribbon used in the flower arrangement can be re-used. The use of packing paper is dependent on the local availability. Green fillers used depend on the local availability and seasonal changes. Carnations are usually known as the flower of gods. Carnation flowers are native to Eurasia. Want to surprise your loved ones on this special day, then this bouquet and chocolates is the perfect gift choice. Your loved ones will definitely love this gift, and will cherish that moment forever. 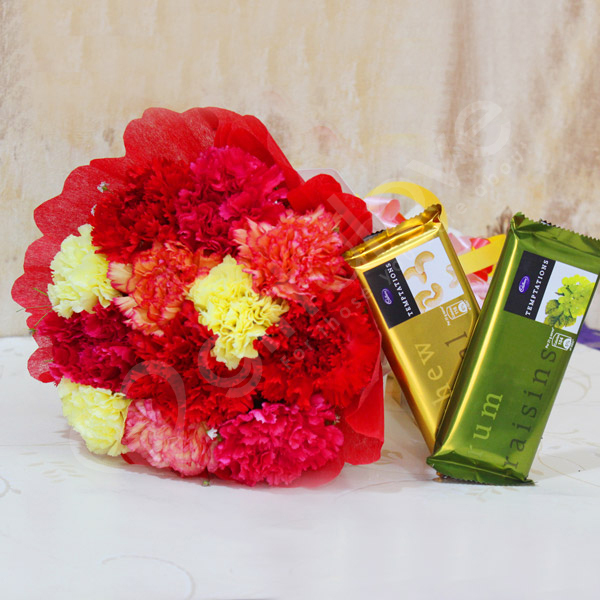 Mixed carnation flower bouquet with temptation chocolates would drive your loved ones crazy. I received this gift of mine a day before the estimated date. Keep up the good work Giftalove!